Reading and share top 11 famous quotes and sayings about Why Not Me by famous authors and people. Browse top 11 famous quotes and sayings about Why Not Me by most favorite authors. 1. "I'm ruined beyond repair, is what I fear...And if so, in time we'd both be wretched and bitter." "I know people can be mended. Not all, and some more immediately than others. But some can be. I don't see why not you." "Why not me?" 2. "I always wanted to be a snake. Every time I saw a snake on TV. I'd always say 'Why not me?'" 3. "Could it be that part of the answer to your question "why not me?" 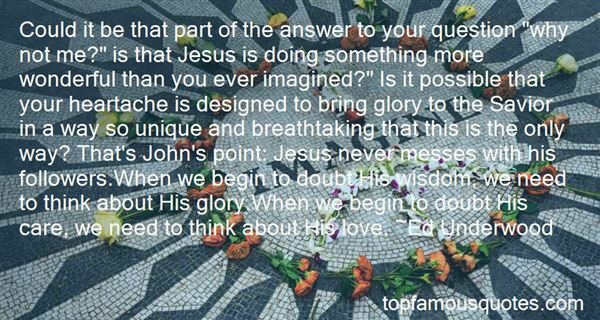 is that Jesus is doing something more wonderful than you ever imagined?" Is it possible that your heartache is designed to bring glory to the Savior in a way so unique and breathtaking that this is the only way? That's John's point: Jesus never messes with his followers.When we begin to doubt His wisdom, we need to think about His glory.When we begin to doubt His care, we need to think about His love." 4. "Someone has to write all those stories: why not me?" 5. "For true success ask yourself these four questions: Why? Why not? Why not me? Why not now?" 6. "The moment he laid eyes on Kuga, I knew. There's a reason I'm doing this to him. I want to see it; how he's fallen in love with a guy, and how he makes him his own. And then what I've done will become a sharp knife, thrown right back at me.That's right. I just wanted to see.And the meaning behind the sharp knife flying towards me: Why not me? Why can't it be me? All this time, I would be lying if I said I've never wished for it, but by being merely an observer, I've somehow managed to distance myself.Kuga is a bright light, like the sun. I, on the other hand... (Yashiro)"
7. "I bare my soul and you are suspicious! No, Scarlett, this is a bona fide honorable declaration. I admit that it's not in the best of taste, coming at this time, but I have a very good excuse for my lack of breeding. I'm going away tomorrow for a long time and I fear that if I wait till I return you'll have married some one else with a little money. So I thought, why not me and my money? Really, Scarlett, I can't go all my life waiting to catch you between husbands." 8. "I met with a man. His name is, "Michael Bush", a very sophisticated sage. He said to me, "Michael, don't associate yourself with people in your age bracket, but relate with elderly men, who had achieve in life far more greater than you, and then, there will be no hidden place for jealousy in his heart, but if you happen to mingle with your mates, they will always say, "why always Michael, why not me?" and you'll be poisoned sooner or later." 9. "Please, please, help me grow to be like them, the ones'll soon be here, who never grow old, can't die, that's what they say, can't die, no matter what, or maybe they died a long time ago but Cecy calls, and Mother and Father call, and Grandmere who only whispers, and now they're coming and I'm nothing, not like them who pass through walls and live in trees or live underneath until seventeen-year rains flood them up and out, and the ones who run in packs, let me be the one! If they live forever, why not me?" 10. 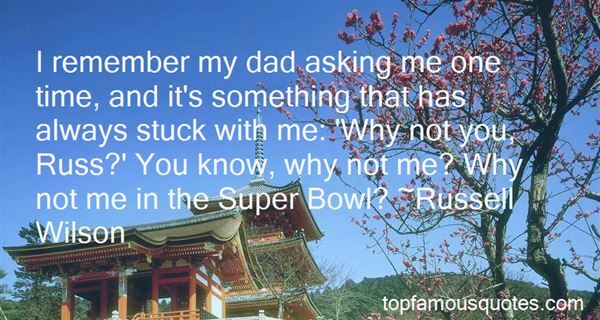 "I remember my dad asking me one time, and it's something that has always stuck with me: 'Why not you, Russ?' You know, why not me? Why not me in the Super Bowl?" 11. 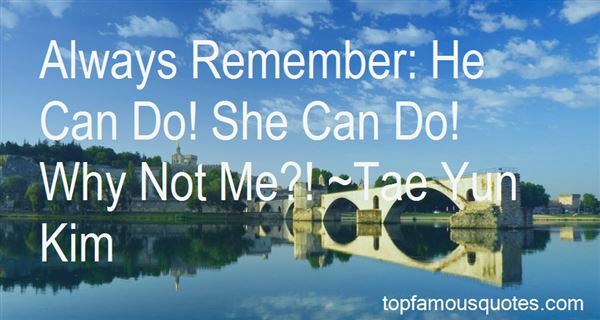 "Always Remember: He Can Do! She Can Do! Why Not Me?!" All is not gold that glitters"